Have you ever had one of those weeks where you fly by the seat of your pants and Friday can’t come soon enough? Maybe this is your every week; no judgement here! When life gets chaotic, it doesn’t have to be an excuse for healthy eating to be back-burnered. Having a few staples in your pantry can make weekday meal planning nutritious and a breeze. Having a pantry stocked with Zone PastaRx, sauces, and canned vegetables (if fresh or frozen aren't available) makes for endless options! Just remember that Zone PastaRx is balanced in both protein and carbohydrates giving you the flexibility to mix and match most everything. Here we’ll show you how simple it can be. 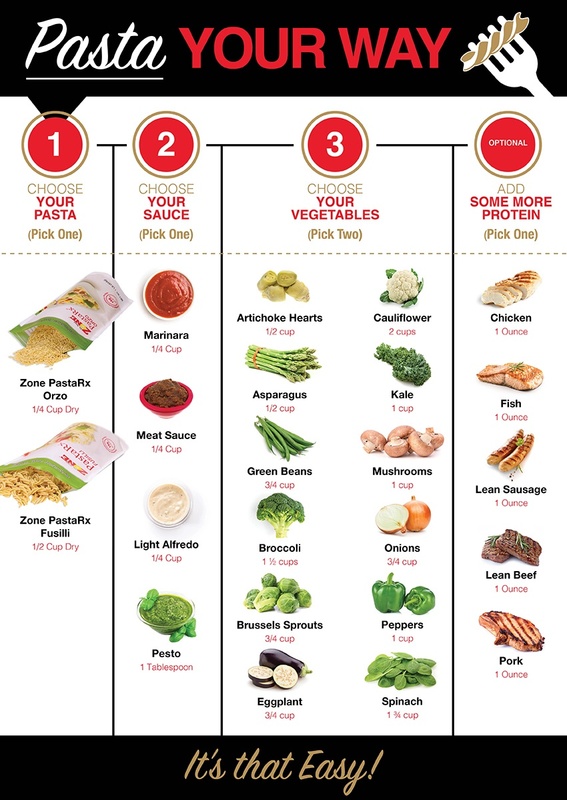 Pick and choose from each of the categories below for meals in a cinch! Zone PastaRx is a patented protein-rich pasta replacement designed to stabilize blood sugar and curb hunger for hours. It's been clinically shown to help increase lean body mass while reducing insulin resistance. Including PastaRx into your weeknights makes meal planning easy and eliminates the guilt. Want more inspiration? Check out more than 100 Zone pasta recipes and purchase Zone PastaRx here. Or share your creations with us in the comments below!